Robbie Cullen from Maungaturoto was out on the west coast recently and had a strange incident in light winds with his Bottom Longline. Robbie has a 300 metre 65kg leader line on his 100kg rig (between the bottle and hook section) so he can get his float bottle beyond the breakers before he puts his traces on. As he was setting the gear the line suddenly started taking off at a very fast rate. On looking out to sea he also noticed his kite was climbing higher than it should and he could see a fish hanging off his mainline around 150 feet in the air. Although Robbie is not sure, he suspects a surfer in the vicinity of his gear removed the bottle and this caused his mainline to become airbourne. Robbie hurriedly hauled the gear back in before the kite could lift his entire mainline out of the water, only one kahawai was on the line. After this Robbie decided to call it quits for the day, but at least he had a fish to take home. Above : Robbie and his friend Alan Place frequently fish together at Glinks Gully. This is Robbie and Alan's son Waylin, showing what they caught back in March. 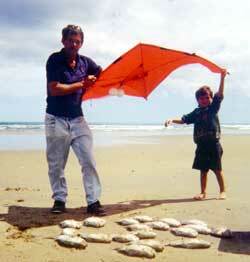 They usually put out three sets depending on the weather, and always use Robbie's salted kahawai and mullet bait. Robbie reports that kahawai are abundant at the moment in the Kaipara where he has been catching plenty in his set net. Robbies favourite kitefishing bait is salted kahawai, check out newsletter 18 in the newsletter archive for instructions on how Robbie salts his baits for using on his Bottom Longline. Robbie caught this nice 4kg snapper (above right) from Glinks Gully back in March this year. Using his Bottom Longline Rig he managed to put out three sets in the 60 to 70 knot winds on the day. The first set produced only three fish. The next two sets were put out to 1500 metres offshore and this fish was hooked at the far end of the rig. Not much kitefishing to report over the last week due to the weather, no wind and plenty of rain. As the attached photo shows there are still some great fish around, if conditions come right Porangahau Beach could be the place to be this weekend. From left Nick Sciascia, Scotty, & Spills, all had a good day out with 3 snapper weighing in at 7.8 to 8.4 kgs and a 12 kg kingie. Some locals who made a trip out in the Bay on their new Senator 6.4m last Thursday did really well. All the fish were taken on a Puka Flash Hot Pink 6/0 hooks baited with octopus. Otherwise it has been very quiet on the beach front. We are now Advance Trident agents so for all your Marine Electronics come and see us. Don't forget to weigh in your kahawai to be to win our kahawai fishing contest. Contest closes on the 28th of November. Prizes totalling $300. No entry fee. 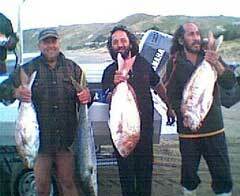 All kawahai must be caught from Porangahau Beach. No Boats allowed. Don't forget, if you want to check out kitefishing, drop in and watch Paul's Kitefishing Video or check out our range of Paul's Fishing Kites rigs, kites and associated fishing equipment. Your rights to fish for food and recreation are still under threat! Your beach access is also under threat! Want to know what you can do about it? Read on! Option4, a dedicated group of advocates for the non commercial fishing public, have been going head to head with the government over the last two years fighting against government proposals to privatise the recreational fishery, and erode your current rights to fish. Despite the fact that over 98% of submissions to the proposal rejected the governments privatisation agenda, it appears the public have been ignored by this Labour Government. Option4 has embarked on a huge e-mail and letter writing campaign to make politicians aware of the publics views and the risks politicians face if they continue to ignore public opinion. Now is the time to tell them what you will do with your vote if they do not recognise that your right to fish has precedence over commercial fishing interests. Option4 have a ready-to-email letter to Members of Parliament at this address http://www.option4.co.nz/mpmailer.php Check it out, it will only take a few minutes! It's an election, they want your vote and need to know how strongly you feel about this issue. There is no better time than now. This campaign is already having a measurable affect, lets keep the pressure on them. Its an opportunity to put real heat on your representatives. Make sure your children enjoy the same rights generations of New Zealanders have always considered a birthright. Don't let this opportunity pass by, your rights, and the rights of your children are worth fighting for! Kahawai seem to be around in numbers according to this weeks reports. Dave Edlington, the Kitefishing Club president spent five days up at Te Arai point recently. Using a combination of his kite fishing gear and a surfcasting rod, Dave managed to catch himself at least five kahawai a day. The kahawai were out just past the surf line which made it easy for Dave to hook up when using his surfcaster. While the weather was not ideal for kite fishing Dave was able to catch himself fish for dinner every day. His recommendation is to fish either early morning or the evening during winter, to give yourself the best chance of catching fish. Te Arai is still producing snapper for Shane. 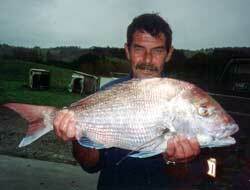 On his latest trip to Te Arai Point he caught plenty of nice sized snapper up to 8lb. Fishing as close to the reef as possible has been the key to Shane's success, he is a very experienced kite fisher who knows this area very well. For those who are not so familiar with the area it is advisable to use a Dropper Rig fitted with sacrificial ledger rigs and safety traces in case you get your traces snagged on the rocks. Tim Gerard has a caution for fishers heading for Omaha Beach. He went to Omaha recently and while he was on the beach checking out the conditions someone broke into his car and removed items from inside. Tim reported this incident to the local police who are looking for the offender. They recommend you do not leave anything of value in your vehicle while it is unattended and keep all items out of sight. The wind was blowing onshore that day so Tim did not get to set his Flexiwing Rig out at all. Tough day all round for Tim. David Billings took his Bottom Longline out to Kariotahi Beach last Friday. He reports there were at least four kites being flown off the beach. David caught one kahawai for the day but reports there were plenty of sharks about. David and his friends from the Kitefishing Club are very keen to get out fishing this weekend, as the weather is looking promising. The club fishing day is on this coming Sunday. Venue will be determined by the weather on the weekend. Listen to 1ZB between 7 - 8am Sunday morning to find out which beach the club will be fishing from.